family.faith.food: Oh, me of little Faith! This is a long one, so go use the bathroom, grab your coffee or water, get comfy and settle in. 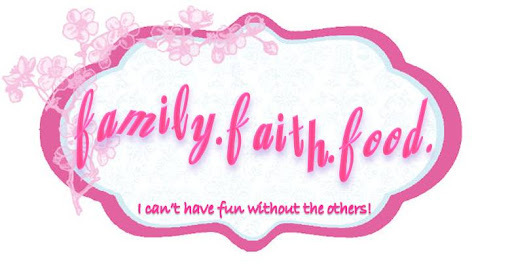 I named this blog Family.Faith.Food yet have not written much about faith. You see, a little over a couple of years ago, shortly before I started this blog, a lot of stuff hit the fan and I'll tell you, I snapped. I broke and didn't care. I was mad at GOD for so many things, I wouldn't even know where to begin. While I've always prayed and never once doubted that Christ died for our sins, I thought I was being punished, that my kids were being punished, that my husband was being punished, and I couldn't understand why. I mean I knew "why" I as being punished, but my kids, so young and innocent and my husband so patient and loving? Everything was "Why, GOD, WHY?!?! I know, a bit dramatic, but I really, really lost it. Mind you, I've read the Bible, participated in church groups and read my devotionals. After my emotional breakdown, I stopped. Even our church attendance suffered. Everyday, I was just going through the motions. Day in and day out; trying my best to set a godly example for my kids, all the while angry and resentful inside, questioning GOD'S motives. I was the seed in Jesus's Parable of the Sower in Matthew 13:20 "The seed falling on the rock refers to someone who hears the word and at once receives it with joy. But since they have no root, they last only a short time. When trouble or persecution comes because of the word, they quickly fall away." (NIV) THAT was me. Last week in church our pastor spoke about resolutions, being the New Year and all. He mentioned that instead of making resolutions to lose weight or read more or watch t.v. less; instead of coming before GOD with our plans already made we can come to HIM and ask, "What do you want from me and for me?" 1. Hearts that Act Justly: Do the right thing (no matter how difficult or inconvenient it may be). 2. Hearts that Love Mercy: Love others with grace and kindness (despite the reasons we can have to not grant it to others). 3. Hearts that Walk Humbly with Him: Live in the realization of the relationship at hand: GOD is GOD and we are his children. Throughout this sermon the Holy Spirit spoke loudly and clearly to me. There were, and still are, some things in my heart that need working on but it begins with HIM. That day, hearing that sermon made a change, one that I've always known, but didn't let sink in: It's not about me, or anyone else. It's ALL about HIM. HE who honored us in his death so that we may honor HIM in our lives. I HAD to make a change. A new sermon series titled "Emotionally Healthy Spirituality" began Sunday, January 15th and I'll be using this blog to share it with you. It's also an opportunity for me to reflect on what was said during the sermon as well as what I experience during the home church group. 2. Ignoring the emotions of anger, sadness and fear (thinking that since you're a Christian you shouldn't be feeling those emotions). 3. Dying to wrong things--the pleasures of life that GOD gives you (not wanting to feel any pleasure at all, feeling guilty for doing so). 4. Denying the past's impact on the present. 5. Dividing life into "secular" and "sacred" compartments (separating GOD from work, home, etc). 7. Spiritualizing away conflict (avoiding helpful truth to keep peace). 8. Covering over brokenness, weakness or failures. 10. Judging others out of our own insecurity and unhealthy need for validation, control, etc. Basically, it's emotionally unhealthy spirituality if you are acting one way on the outside but are another way on the inside and that many of us fear what is beneath our surface. We fear what's beneath the surface because "we are controlled by what others think of us, we avoid our human limitations and weaknesses and we're too busy "doing"; keeping busy doing life above the surface there's no time to deal with life beneath". There you have it. Later this week we'll be meeting with our home church group and I'll be able to share more with you.